This has been a strange, and very nerve-wrecking, free agency summer for National Basketball Association (NBA) fans. I was NOT expecting things to turn out the way they did. In fact, at the beginning of the summer I wrote a nice little post telling Cleveland fans to get over it. I listened to radio heads Amy Lawrence (CBS) and Dan LeBatard (ESPN) calm people (including myself) down, as they thought the same thing I did about the supposed Decision 2.0. They (like I and a lot of people) thought that this guy would not walk away from a team that had just been to four straight NBA Finals, and won two championships. Of course, we were all wrong. Full disclosure: I am a Miami Heat fan. Not a bandwagon fan either. I do not live in Miami, and was a fan of the team back when Shaq quit on them, and even when Dwayne carried a team that has less talent than the 2013-2014 Cavaliers (Cavs) did to a four seed (NBA playoffs) that gave Boston all they could handle. I have enjoyed the past four seasons, and have nothing but respect and admiration for LeBron James as a man and a basketball player. With that being said, I have to call a spade a spade, and answer these five questions open and honestly… albeit with a little bit of bitterness. Why Did LeBron Do Better With This Decision Than The Last? It was pure and simple brilliant marketing. The ESPN produced ‘The Decision’ was met with vitriol and spite that took two full seasons to fully reverse for James and his camp. The essay that was carefully crafted and placed into the pages of the world’s most predominate sports publication was masterful. He had to do something that would be seen as both heroic and classy, yet would not offend any large populous of NBA fans, writers, or executives. Mission accomplished. The only people that could have any hurt feelings would be Miami fans, but given that the premise was “going home,” even those people have to initially squelch their disdain. Besides, he was leaving in a similar manner in which he came… how upset can anyone really be with that? If you dissect that essay, you can find things that give the reader an insight into the mindset and planning James and his team has had for quite some time. The obvious things have been written and talked about at length: No mention of Andrew Wiggins or Anthony Bennett (the Cavaliers number one overall selections in the last two NBA Drafts), the squelching of any discord between himself and the Heat organization, and the omission of any sort of acknowledgement of the Miami Heat fans themselves. Those are too obvious. We’re not ready right now. No way. Of course, I want to win next year, but I’m realistic. It will be a long process, much longer than it was in 2010. My patience will get tested. I know that. I’m going into a situation with a young team and a new coach. I will be the old head. But I get a thrill out of bringing a group together and helping them reach a place they didn’t know they could go. LeBron chose the Cavs, because he feels that they have a better chance of not only winning now, but in the future. That is the reason… that is the only reason. He did not believe that going forward with the Miami Heat would be good enough to compete for championships. To be even more frank, he did not think the Heat could put the collection of talent around him that he needed to further his legacy. That not only includes championships, that means MVPs, All-Star MVPs, and even regular season titles (most wins). But this is not about the roster or the organization. I feel my calling here goes above basketball. Yes, he loves Akron, he grew up there, all of his friends are there, he has strong (very strong) ties to the community but this is not homecoming week for the high school football team. Living somewhere and working somewhere are two different things. He didn’t sell his Ohio home. He spent most of his offseason there and continued to be committed to charitable efforts there. He and his wife have started businesses in Miami, developed ties, and enjoyed success there… he was not miserable. The truth is, a player of James’ stature cannot afford to let years go by without amassing championships. He is chasing Jordan – He needs at least six to legitimately have an argument for being the greatest player ever. The Cavs have a young Kyrie Irving, who is suited with the potential to become the best point guard in the league. They also had the assets to acquire Kevin Love, who many consider to be the best power forward in the league (I am not one of those people, just read my previous post about Love). At the start of this coming season, Irving will be 22; Love will be 26. They are younger and physically better than both Bosh and Wade. The Cavs have/had the ability to add players that James would want (Ray Allen, Mike Miller, and James Jones) to make James’ transition much easier. There are rumblings about James’ fledgling relationships with Pat Riley and Erik Spoelstra. Things like: 1. The Miami Heat amnestied Mike Miller before the start of last season. 2. The Heat wouldn’t give James’ people the kind of access to the team and facilities that they enjoyed with the Cavaliers. 3. James was upset about the amount of time Wade took off (26 games) during the season while undergoing his “maintenance plan” to get him better prepared for the playoffs. I always assumed those rumors were nothing serious, and that James wouldn’t base a decision about where to play on such small things. But, according to some of the reports from reporters around the league, I was wrong. How Long Did LeBron Know He Was Going To Leave? I always believed that I’d return to Cleveland and finish my career there. I just didn’t know when. I believe that statement. I do not think he ever anticipated the type of backlash he, Wade, and Bosh received once their decision to play together was made public. James has always been a guy who loves to be loved. He has been adored and fawned over nationally since junior high school, and has never known a world in which he was hated; had to prove himself; had to answer for decisions made outside of a basketball court. As a diehard Miami Heat fan I remember some things now, that I should have paid more attention to. I remember shortly after the lockout, James talked about how maybe guys like Kevin Love might want to leave their current situations in the future (something like that). At the time, I thought he was just talking about the new collective bargaining agreement, and how it was going to make it difficult for superstars to join together in the future, but now I see it was a subtle recruiting ploy. I remember a game between the Cavs and Heat in which James caught an alley-oop from Irving (Irving was just throwing up a half-court shot at the halftime buzzer) that made me pause. I also wonder if James allowed Irving to win the 2014 NBA All-Star game MVP (James was having a great game, and seemed to back off a little bit down the stretch). I don’t have anything concrete, but those little things add up to a lot of conspiracy… and that adds up to James leaving a four-time conference champion to bolt to a team that has been in the Lottery each year during that same span. What Now For The Cavaliers? That is the easiest answer on the list: Championships. If nothing else, the NBA has historically held one thing to be true: In any given season, the best player in the league will always have at least a chance to win a championship. In my opinion, James is the defacto general manager of the Cavs. He will also spend time as the coach, personal trainer, and part-time owner. Seriously, the Cavs were so desperate to have him back, I am sure they will do anything to keep him. He and his people (manger, agent, and friends) will get unprecedented access to the NBA franchise he plays for. I believe James is out to show what Michael Jordan wanted to show: Organizations do not win championships, great players do. I get the feeling that James has resented some of the adulation Riley has received from the national media for supposedly putting together the Big 3. I also get the feeling that James believes he could have, and would have, made better moves than Riley did over the last three seasons (especially the last one,) to make the team better and even more iconic. James is going to a team whose coach, David Blatt, last coached the Maccabi Electra in Tel Aviv, Israel. His running mate (whether it is Love, Irving, or both) will be a player who has never played an NBA playoff game… ever. Again, the Cavs have been proverbial losers in each and every season since James’ departure. He will look like an absolute God if (and when) he wins the NBA Championship, especially if he wins it right away. What Now For The Heat? LeBron left the Miami Heat between a rock and a hard place. He did not allow a sign-and-trade (like he did for the Cavaliers,) so the Heat got nothing in return for his departure. I am not onboard with the national sentiment that the off-season moves made by Pat Riley were so great. I’m a little spoiled, and I feel that my Heat just will not have enough players to seriously compete for the Eastern Conference crown, let alone the NBA Championship. They can be competitive, just not championship competitive. The Cavs, Pacers, Bulls, Wizards, and Raptors are the only teams in the East that have the opportunity to finish with a better record than the Heat (maybe not the Pacers now with the Paul George injury). I am a fan at heart, and always hope for the best for whatever team I am rooting for. In my wildest dreams I could see Chris Bosh leading the league in scoring; Wade re-inventing himself into a 20 and 10 (assists) guy; the team resigning Greg Oden and he reaches 80% of the potential everyone thought he had; James Ennis wins both the Sixth Man of the Year and Rookie of the Year by averaging 18 points per game off of the bench. Those things probably will not happen, but like I said, the team will be competitive anyway. I am of the opinion that James did not have as bad of a supporting cast as many people think. Wade is getting older, but he’s still a top 20 player (yes top 20) when healthy. Bosh takes a lot of flak from people, but I believe he is a top 20 player as well, and possibly the hardest cover in the league (don’t laugh… he can shoot outside or inside, post up, dribble, pass, and play better-than-average defense). I am going to write a future post about the misconception of James’ 2014 Finals performance. Everyone thinks he had such a great Finals, and that his Big 3 teammates let him down, but the numbers tell a different story (again, we will get to that some other time). Besides, the narrative that Wade or Bosh let James down in this past Finals is laughable when you consider the all-time stink-fest James put out in the 2011 Finals against the Mavs. Wade, Bosh, and the entire Heat organization rallied around him during a time when the world (sometimes it seemed literally, the world) was crashing down around him. Maybe I am taking things too literally, but is he trying to say that in Miami things were just handed to him? Didn’t they work hard, and sometimes very hard to reach the Finals… four straight years? Isn’t putting potentially the best point guard (Irving), the best power forward (Love) and the best small forward (James) on the same team giving themselves the best opportunity to win? Is it only considered earned because it will be taking place in blue collar Cleveland, rather than fair-weather Miami? Having perspective is a passion of mine, but it escaped me this summer. James’ decision left me little bitter, and also a little bamboozled. I should have learned from the summer of 2010 that the old way of doing things has become obsolete. Conventional is unconventional – The unexpected is the norm. If you think about everything, James essentially did the same thing he did in 2010, except this time, he just found a way to make everyone happy about it. 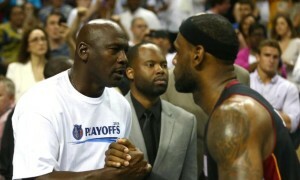 Michael Jordan vs Lebron James: The Greatest of All Time!